Swansea City boss Paul Clement says he is looking forward to returning to his former club Chelsea, but that the result will decide his final mood. 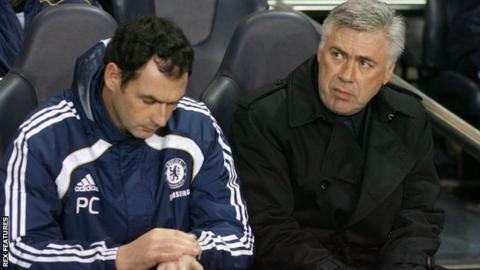 Clement began his coaching career with the Blues and won several trophies as assistant to Carlo Ancelotti. He returns to face the runaway Premier League leaders as a manager for the first time having guided the Swans to three wins from their last four games. "It depends how the game goes and how I feel about it after," said Clement. Clement is expecting a reasonable reception at Stamford Bridge, although he believes he will not be the centre of attention. That accolade, he insists, will go to one of his assistants at Swansea, Claude Makelele, a legend at the London club, making 217 appearances during his distinguished playing career and who Clement is determined to keep on his staff at the Liberty Stadium next season. Clement said: "When I have been back, those few occasions, people have always been very nice. I will be interested to see what happens this time. I think Claude will get a fantastic reception as he is so well known. Me less so. He was a legend for the club and is excited about going back there." Clement began his coaching career back in 1995 at the Chelsea Academy before returning as a coach in 2007 and became Ancelotti's number two in 2009. In their first season together the pair guided the Blues to their first ever Premier League and FA Cup double and Clement unsurprisingly has fond memories of the time. "It was a brilliant learning experience," said Clement. "The players were very respectful. I was working with a great coach in Carlo and (coach) Ray Wilkins had great experience. "What I remember about that season is how mature and strong the team was. (Petr) Cech, (John) Terry, (Michael) Ballack, (Frank) Lampard, (Michael) Essien, (Didier) Drogba...strong characters. They were right at their peak at that point." And it seemed even the bad times had their good moments too with Clement recalling Ancelotti's shock sacking in a corridor at Everton's Goodison Park in May 2011. "I think Carlo was half expecting it with what had happened leading into that game. Maybe he didn't expect it right at that moment, but there you go," said Clement. "I was there. I'd gone in to have a drink with David Moyes. He told me on the bus that he'd been told by the dressing room by (then-Chelsea chief executive) Ron (Gourlay). "Then word gradually got around. When we got back, we went out into London and had a really good night. It was really good. It was a bar up in town. We went with some players." Since leaving Ancelotti behind at Bayern Munich to take charge at Swansea, 45-year-old Clement has rejuvenated the Welsh club, pulling them clear of the relegation places with impressive wins over Liverpool, Southampton and Leicester. Clement is enjoying life as a Premier League boss, having been named manager of the month for January. "It was a great moment leading my team out at Anfield," said Clement. "It was a great moment leading my team out against Manchester City to come up against (Pep) Guardiola, someone I had really admired and the work he did at Barcelona. "So to come up against him, compete and come to close and afterwards have a drink with him, just me and him, and to talk about football. It is great. Brilliant."